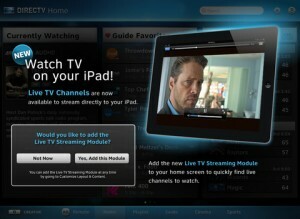 The already awesome DirecTV iPad app got even better buy streaming live TV. It only works in your house, like the whole-home DVR. Not every station allows for streaming. There is a list of around 30 stations. The funny thing is Fox is on the list but DirecTV might lose Fox soon if they can’t reach a deal. One of the cool features is you can swipe up the live show playing on your iPad to send it to your TV. I’m still playing around with it but I’ll get a full review of the app soon. Only 30 channels? Well that seems a bit limited. Plus you can only watch the few channels while you are at home! I would expect that an app for an iPad would have portability as a given. I use a similar app called the DISH Remote Access app from my employer DISH Network. But it is better in so many ways! I don’t have to be at home just to watch TV. On another note, I can stream any channel that I subscribe to, and I can even stream the recordings on my DVR. Speaking of subscribed channels, I know that some of the available channels that are on their app are up for removal. I know last year DISH and FOX were in a similar battle, but thankfully, they were able to work out an agreement so we don’t have to worry about them being taken down. I like the idea of the app, but it still seems a bit limited. As for the channels, hopefully everything works out for DirecTV customers. They have a limited enough selection on the iPad as it is, and don’t need more taken down.